Vine Nets Australia are national suppliers of high quality throw over crop protection Bird Netting delivering to anywhere in Australia. With a choice of Crop Protection Bird Netting to meet your budget and size requirements, you cannot find a better choice of nets than those from Vine Nets Australia. Quality Woven nets using only the best Polyethylene and UV additives, ensure maximum life for Australian conditions. Our aim is to deliver to our customers the highest quality product, at the best possible price with the best possible service. We deal direct with the end user of the net allowing you to save money, and allowing us to be in contact with the needs of the industry. This helps us to ensure that our product is always a step above the rest. No problem we are happy to supply small quantities for fruit trees and home orchard projects. Let us know what you need and we will do our best to find a product to suit. Please check out our products at Our Products and if you would like any further information complete the quote request or call Freecall 1800 677 757 at anytime. To deliver to our customers the highest quality product, at the best possible price with the best possible service to anywhere in Australia. Vine Nets Australia is a privately owned company based in Augusta, Western Australia, which is in the heart of the Margaret River Wine Area. We have over 25 years experience with netting and pride ourselves on being able to offer the very best service, both before and after sales no matter where you live. 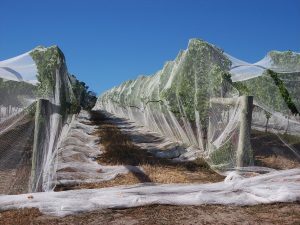 Vine Nets Australia is also a member of the Margaret River Wine Industry Association and through this association has developed a set of standards to help growers understand the technical aspects of netting enabling them to get the best product value with their purchase of bird netting. To see a copy of our easy to understand netting manual click here. We have over many years established ourselves as a reliable supplier of high quality Anti-bird netting throughout Australia, delivering quality, cost effective netting with great service. 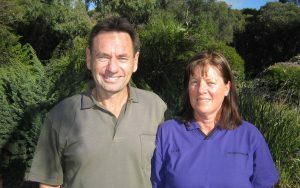 Brent and Leanne Ettridge are Managing Directors of Vine Nets Australia. Brent has been involved in sales and marketing for many years and is responsible for these areas within VNA and would be more than happy to discuss any issues with regard to netting with you. Leanne with her vast experience in Administration is responsible for Finance and Administration as well as helping with sales.